This guide aims to provide an understanding of the self-destructive behaviours of teenagers, and to encourage adults responsible for teenagers to begin to find ways of tackling them. ;Almost every day, there are reports of yet more teenagers inflicting tragedy upon themselves or other people. And the response so often from adults is a bewildered, Why do they do that? ;The book is based on the experience the author has of talking with teenagers about what matters, and of analyzing and understanding youth culture. It provides no easy solutions, recognizing that every individual and circumstance requires a unique approach. - Publisher Aimed at those bewildered by their seeming alienation from adult culture, this wide-ranging analysis provides practical insight into the teenagers' world. Pollard covers topics such as drug abuse, eating disorders, and a lack of respect for authority. About "Why Do They Do That? 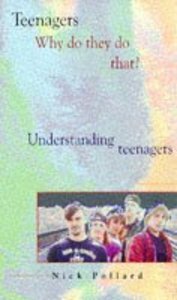 Understanding Teenagers"
Aimed at those bewildered by their seeming alienation from adult culture, this wide-ranging analysis provides practical insight into the teenagers' world. Pollard covers topics such as drug abuse, eating disorders, and a lack of respect for authority. All You Ever Do Is Criticize - Why Are Teenagers So Critical?